There are a few lessons that every parent should pass onto their child — and empathy is a big one. Father and cartoonist Chris Grady teaches empathy through a comic called Lunarbaboon, which he’s been working on for five years. Since Grady is also an elementary school teacher, he knows the important lessons every kid needs to learn in order to be a kind, smart, and influential person. According to an interview with HuffPost, Grady took up cartooning as a way to deal with his anxiety. He found that by drawing, he was able to stay positive. Eventually, he learned that others were also getting a lot out of his work. As his audience grew bigger, he realized that he had a platform to really make a difference. His comics touch on real issues in a heartwarming way. Here are just a few of our favorites. You might even be inspired to send them over to your parent friends. This one is a reminder that not only should consent be something parents openly discuss with their children, but that it’s a topic that everyone should be able to easily understand. This one is just another solid reminder that women do amazing things. With this comic, Grady managed to illustrate how we often feel on the internet. This one is all about respect within a marriage. His comics help illustrate the fact that we’re all different, and kindness and empathy are the best tools we have. 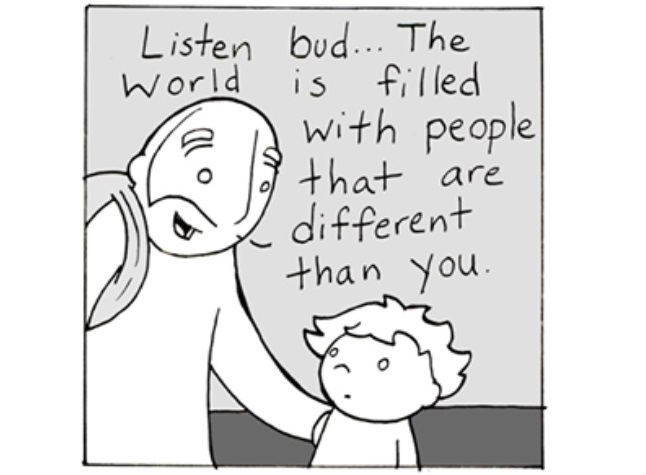 Grady’s main goal with Lunarbaboon is to try and create good people. “I try to show them that even with all my flaws and weaknesses, I am still a good person, and I can still make a positive change in the world,” he noted. We think he’s doing a great job of that so far.